As I mentioned in Part I of this post, going on safari was at the top of my South Africa bucket list (and my bucket list in general), just as diving with Great White Sharks was at the top of Dana's. As a kid, I was always obsessed with the "big cats," and you will find many of them in South Africa, such as lions, leopards and cheetahs. Naturally, seeing those were a priority for me during our 2-day safari. Kruger National Park is the largest game reserve in South Africa, and one of the largest in all of the entire continent. While there are camps you can stay at within the park, my research led me to Sabi Sands, which is a private game reserve just outside of Kruger. There are no fences between the two, so the animals are free to roam as they please. 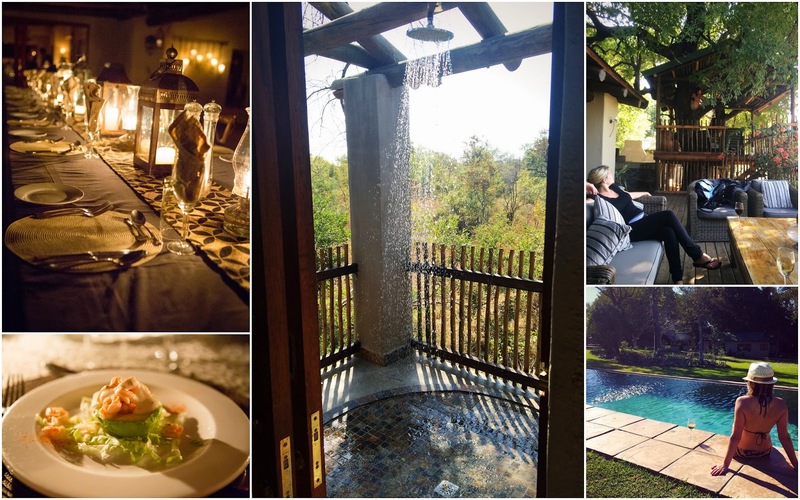 Benefits of a private reserve include luxury accommodations and often times, better game viewing. We flew from Cape Town to Skukuza airport on Airlink (affiliated with South African Airways). Skukuza is by far one of the coolest airports I've ever seen. It's smack dab in the middle of the bush, and it's very small and beautiful. An open air waiting area at the gate greets you with comfy couches and lofted ceilings. It was there we were greeted by Thomas, who was sent from our safari lodge to drive us the 45 minutes to Notten's Bush Camp. Three girls from the UK (Jasmine, Amanda & Lyndsey) were also on our flight and staying at the same lodge, so we all traveled together over bumpy dirt roads in a large open-air Land Rover. Little did we know at the time, the six of us would be logging a lot of quality hours together in that vehicle for the next two days. If I had to pick one word to describe Notten's Bush Camp, it would be: "magical." I know that might sound a little cheesy, but if you ever have the pleasure of staying there, you will understand what I'm talking about. It's one of the oldest private game lodges in South Africa, acquired by the Notten's family in 1963. In 1986, the family opened their private home as a bush camp for visitors. It is now in its 4th generation of the family, and that's exactly what it feels like to stay there. At Notten's Bush Camp, you are truly part of their family. 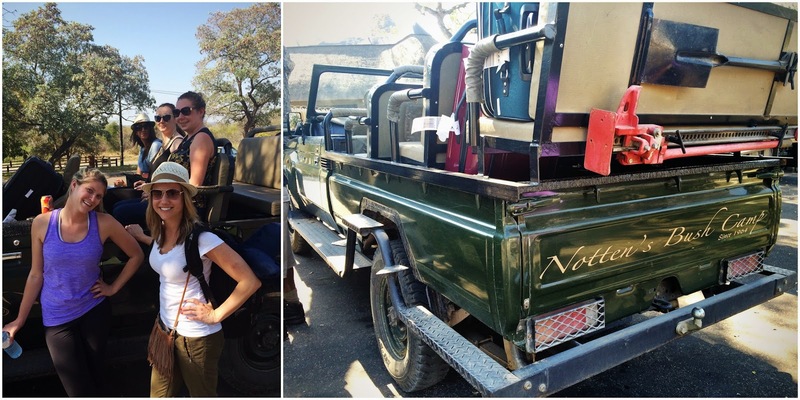 By now you know my obsession with Trip Advisor ratings, and it comes as no surprise that Notten's is one of the highest rated in Sabi Sands. In fact, the only ones rated higher will often run you 3 times as much money as Notten's, and I would venture to say you don't get the same family-type atmosphere. There are only 8 "rooms," and I put that in quotes because they are less like hotel rooms and more like little guest houses. Each one is free-standing (no shared walls), with a porch looking out on the bush, and a shower facing the wilderness as well. (I'm going to go ahead and declare those outdoor showers I experienced at Notten's as the best showers of my life). The travel Gods continued to shine on us, as we were given one of the two suites, which actually had two bedrooms and two bathrooms. The pool was gorgeous, and there's a small spa where an hour massage will only cost you about $34 (it was heavenly). Meals at Notten's are first-class, and you will receive more food than you can ever attempt to finish. They are included in your stay and you receive three of them per day: breakfast (both continental items and cooked to order, hot food), high tea (which is more like a late lunch at 3pm), and dinner, which is enjoyed family style at a large table with all of the guests. We made lots of new friends, (including a couple from SF!) and swapped safari stories over great food and copious amounts of wine. One rustic and charming feature here is that there are no lights. Coming back from the afternoon game drive for the first time is extremely enchanting, with the entire place lit up by lanterns and candles. (Don't worry, all rooms have outlets for charging camera batteries and phones). Along with our new UK friends, happy hour in the little "treehouse" overlooking the dining area was a favorite pastime before dinner. Speaking of drinks, another plus of staying here: all alcohol is included in the price as well (they may have lost money on Dana and me in that department). Of course, the real reason you come to safari is for the game viewing, and just like everything at Notten's, it was top-notch. During your stay, you will experience a morning drive and an afternoon drive every day. 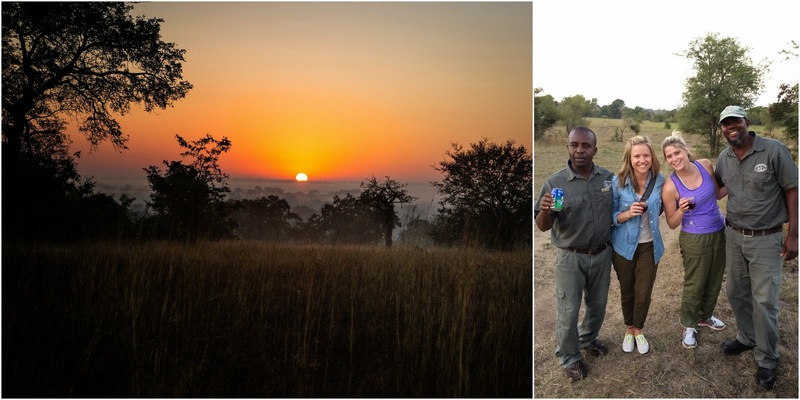 Mornings start very early on safari: you will receive a knock on your door at 5:30 a.m., along with a thermos full of hot water for making coffee or tea, and leave shortly thereafter, at 6:00. (Game drives last approximately 3 hours). The morning drive is followed by the large breakfast, the afternoon drive is preceded by afternoon tea and followed by dinner. You will have the same spotter and ranger for your entire stay, and depending on guests' arrivals and departures, you will likely be with the same group of guests as well (never more than 6). The Big 5 consist of: elephants, lions, leopards, rhinos, and water buffalo. While Notten's cannot guarantee you will see all five, almost everyone does. We checked them off our list within our first three drives, and others we spoke to saw them in just two. Since we arrived in the middle of the day, our initial drive took place in the afternoon. Our first Big 5 encounter was a herd of about 15 elephants! 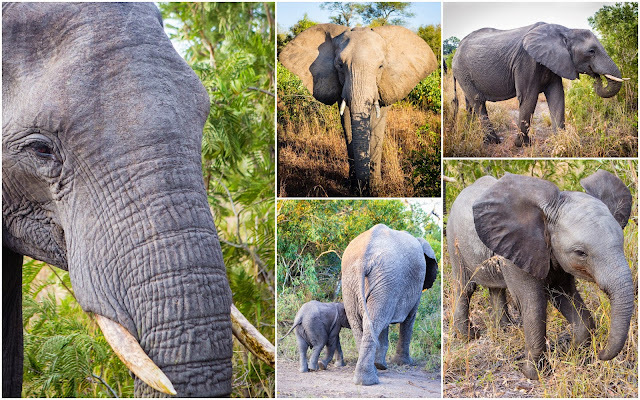 In fact, we saw elephants on 3 of our 4 game drives and had some interesting moments with them. On our second elephant sighting, a large female charged at our vehicle and gave us all quite the scare, but Thomas never even flinched. (My first instinct was to start snapping photos of course). He explained she was simply protecting her baby, but that she wasn't seriously threatening us, just giving a stern warning. Our third elephant encounter was the only time Thomas got even the slightest bit nervous. As I was snapping some close up shots just a few feet away from another female, Thomas calmly said, "We must be going now." We actually didn't end up leaving, but he told us later that the way she turned and looked at us made him uneasy. I loved watching the elephants snap off tree branches with their trunk and nibble off the bark as if they were eating corn on the cob. After our sundowners on the first game drive, we saw our first big cat, a group of 3 male lions. They were scraggly looking fellas, very skinny, and Thomas told us they probably hadn't eaten in almost two weeks. (Two weeks?! I would be so hangry!) He explained that the women are better hunters (obvi), and are always better fed. 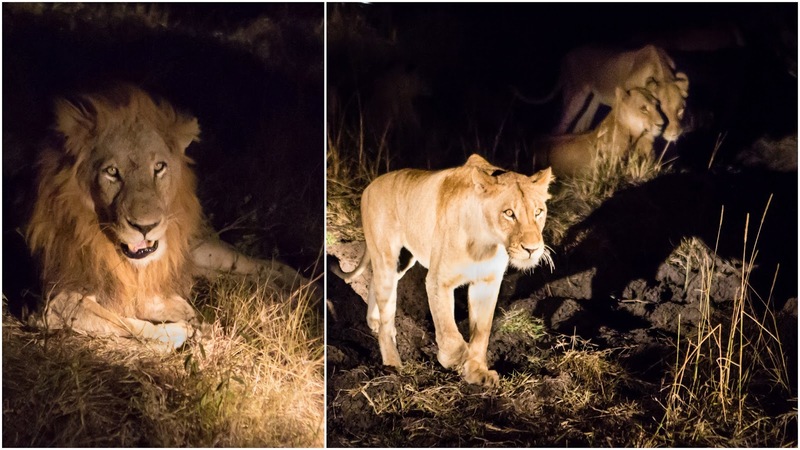 Because these animals are nocturnal, the large flood lights do not bother them, and you will likely see more of the lion action at night. (Though other guests at Notten's saw some "playing" during the day). 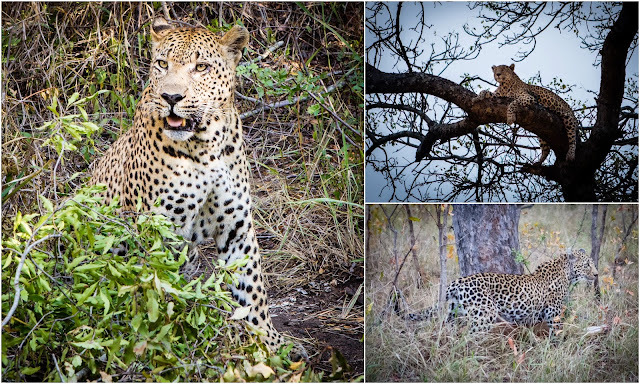 On our second afternoon drive (our 3rd overall), we saw a pride of 6 (SIX!) lionesses. At one point, we were completely surrounded by them, but thankfully, they had no interest in eating us for dinner. Thomas explained that the animals are not afraid or threatened by humans because they have grown accustomed to us being around and know that we are not there to hurt them. My favorite animal of the trip was the leopard, and we were lucky enough to see both a male and a female, and both shortly after making a kill. We spotted the male (pun intended) on our second drive (he's the one on the left). Several of the vehicles were tracking him through a river bed, and when we finally found him, he was literally a stone's throw from our camp. When we approached, he bared his teeth at Kenneth, which Kenneth told us later made him a little nervous. The leopard had already eaten part of his impala for breakfast, and we saw him feed again while we were there watching him. Yes, that's me proclaiming: "That was so cool." It WAS so cool. According to Thomas, that leopard is 17 years old. She definitely was not showing her age! Watching her effortlessly gallop up the side of a tree with an impala in her mouth was one of the most magnificent things I've ever seen in real life. My second favorite part about this video is you can hear Thomas say "Wowwwww," which he said anytime we saw an animal. That, and the way he said "Yahhh" made Dana and me smile every time. 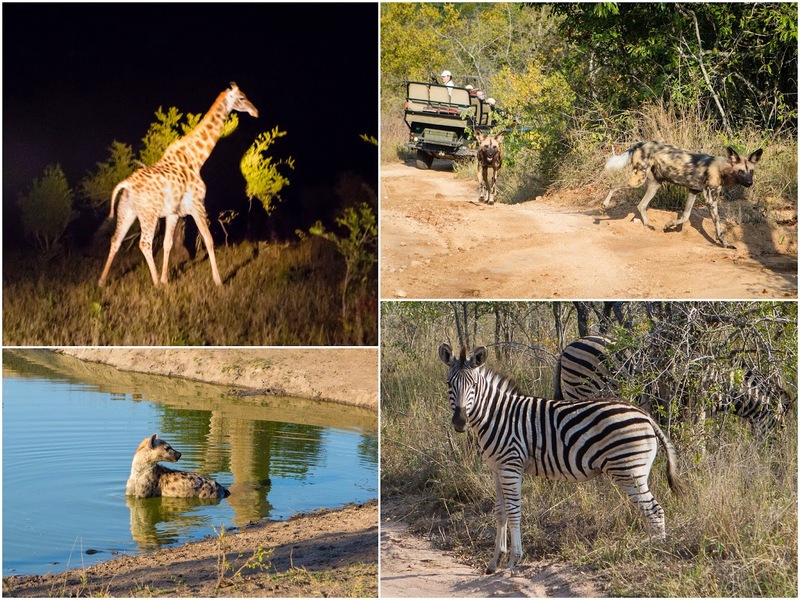 We checked the final two of the Big 5 off our list on our third game drive (right before we saw the lionesses). Just like you see in movies or on National Geographic, the rhinos had several birds perched on top of them, just chillin'. Apparently they don't mind because the birds will eat the ticks off of them. The rhino is Thomas' favorite animal. Thomas informed us that in Africa, water buffalo are just called "buffalo," haha. They looked like a mix between a domesticated bull and a buffalo back home. Surprisingly, they are said to be the most dangerous of the Big 5, as they are extremely unpredictable and give no warning before attacking. It was kinda cool that we saw a water buffalo actually in the water, but some others at Notten's saw an entire herd! Of course, the Big 5 represent just a fraction of the wildlife you'll see on safari. The rangers are only allowed to go "off-roading" for Big 5 viewing, but you can see plenty of others just driving around. (I put off-roading in quotes, because even the normal roads seemed like off-roading). We saw plenty of impala (similar to antelope), kudu (similar to elk) and grey duiker (similar to deer). We also came across a giraffe on the first night on our way home from our first game drive, but sadly that was the only one we would see the rest of the trip, so I only have the one slightly blurry photo (Thomas didn't want to use the flashlight too much on it because giraffes are not nocturnal). We also saw a hyena cooling off in a watering hole and two herds of zebras (they say "zeh-bra" instead of "zee-bra"). On our final drive, Thomas also tracked down two wild dogs (similar to wolves in the U.S.), which we were told are extremely rare to see. By the end of our trip, one of my favorite pastimes became trying to decipher the "bush language" on the radio to determine what exactly we were chasing. Thomas told me not to do that, haha. Jasmine always encouraged Thomas to "talk to the team," though he tried to keep everything a surprise as much as possible. I will say, that element of surprise when we approached a group of animals was really memorable. As part of your stay at Notten's, you are invited to go on a "bush walk" after breakfast each day. 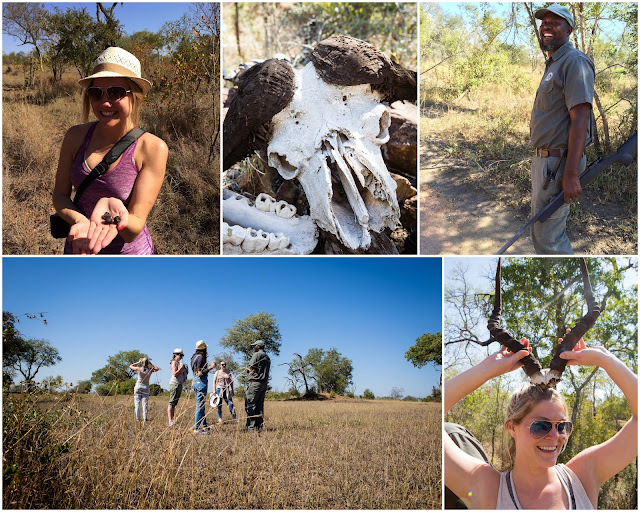 We just so happened to pick a day when Thomas was leading a walk, and got to see his "collection" of animal bones and skulls, which he piles near a river bed. (As Jasmine comically pointed out, "some people collect stamps, Thomas, just sayin'.") You don't really see any animals on the walk, but you will learn a lot about animal tracks (I spotted zebra tracks!) and droppings (yes, that's dried up giraffe poo I'm holding... when in Rome). It was fun and informative, but also pretty hot so I would recommend only doing one so you can spend your other time at the spa and pool. Group selfie of "the team"
We stayed 2 nights, which included 4 game drives, and it was perfect for us. We could've definitely done a third night, but four would be too many in our opinion. As we said good bye to our new friends and set off for the airport, Sheldon (who is training to be a ranger) pointed out a male and female lion sleeping in a shaded riverbed by the road... A perfect exclamation point on our amazing trip. Big thanks to Dale, Dave and the entire staff of 38 people at Notten's who made our short stay in their home unforgettable (especially Thomas and Kenneth). Also, a special shout out to Gift, who is truly a gift, and might be the nicest and happiest lady I've ever met. Overall, our vacation to South Africa was the best trip I've ever taken (which is saying a lot, because I've visited a lot of places). As my friend Adam described before we went... "life changing." So if you haven't already, read Part I and Part II of our adventure and start planning your South Africa vacation ASAP! Thanks so much for your sharing your experience! I felt like I was there with how well you described everything. Sounds like you had an awesome time! I've always wanted to go on an African safari.